We are a huge gaming family: board games, card games, computer games, Wii, etc.…we love them all. Unfortunately, not all of our favorite games are cruiser friendly, but some are! What makes a game cruiser un-friendly? A board. Games with big boards, even ones that fold, are hard to store. It’s easiest to take games out of their original packaging and store them in large Ziplock bags or tupperware, and the boards are always the biggest part of the game. Some cruisers cut their board on the fold lines, but to us, that seems like a gaming crime. Cruising friendly games are small in stature making them travel friendly. Lots of space needed to play. If you need space to play the game, it’s probably not gonna work on a boat. Like Twister, great game, folds nicely, but where are you gonna play? (Yes, you can bring it to the beach, but…sand.) Another example, we love playing Wii games, and even though we have a catamaran, we couldn’t justify bringing it. We don’t disagree with others who’ve chosen to bring their systems aboard, but for us, & a handful of reasons, we decided against it. I digress, cruising friendly games can be played in the cockpit or any place with a small table because, when played, they take up a small amount of space. Number of players. Sometimes you need a game for 2 players, but most of the time, you’ll need a game that allows 4 or more players (sometimes a lot more). Cruiser friendly games have versatility. They can be played with 2 players or a crowd. So, we love Scrabble, but Scrabble just isn’t boat friendly. Bananagrams to the rescue! It’s basically Scrabble, but smaller and without a board. You also play individually and compete by creating your own crossword type puzzle and whoever uses up all their tiles first wins. It’s a speedy individualized word game and it is my gaming nirvana. We are big time card players, but hadn’t heard about this one until we started cruising. If you like Solitaire, you’ll love Nertz. Imagine everyone playing a condensed version of Solitaire simultaneously and whoever plays all their cards first wins. Ok. That simplifies it a bit too much. It’s fast paced game and the object of the game is to finish with the most points. Points are earned by placing your cards on ‘community cards’ in the middle. Sound confusing? Here’s a video I found on YouTube that helps explain it. (He calls the game Peanuts, but it’s the same thing.) This is a crowd pleaser, but when you get more than 6 people playing, it gets pretty crazy…and with that many people playing, you need a big table. Cards also aren’t keen on getting wet. This game is all about dice rolling, strategy, and chance. You need 6 dice, a pencil & a piece of paper. That’s it! 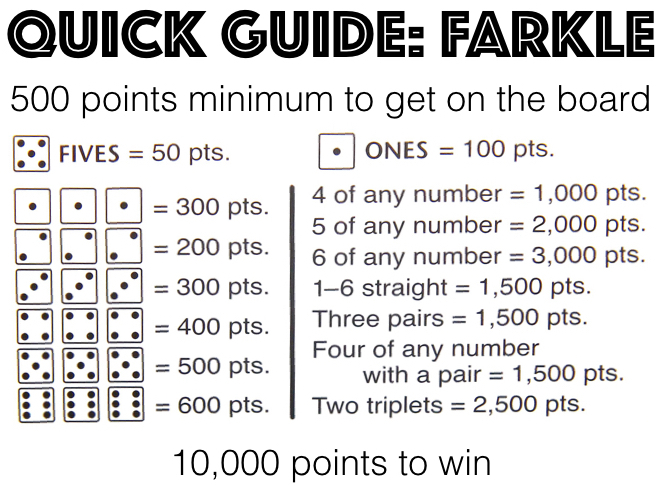 You roll the dice, and make as many points as you can without getting a ‘farkle’ (i.e. no points). This guide from GatherTogetherGames tells you how to earn points. First one to 10,000 wins. Here’s a video I found on YouTube that helps explain how to play. This is a great game for a crowd, just pass the dice cup around the table. One of the things I like about this particular version is that it has 6 full dice cup sets. This speeds up the game because it negates the time it takes to pass the cup. We sadly do not have this particular version, but when I purchase another, this will be the one that I buy. Why? Like I mentioned above, having 6 full sets will speed up the game, not to mention…you’ll have 6 sets of dice! So, when one dice inevitably gets lost, you’ll still have 5 full sets and a few dice to spare! Also, we’ve not played with the ‘official score cards’. We just usually use a piece of scrap paper to tally scores. Yes, it’s Dominos, matching like numbers, but I’d argue that this rendition is the best and most fun way to play. Here’s a video I found on YouTube that helps explain how to play. When we play with the kids we tend not to worry about points and just focus on how many times each person wins. Word of warning: it seems that every boat has their own rendition of this game. Differences are usually small nuances, but the first time you play with someone new, be sure to ask them how they play so you can adjust. It’s customary to play the way the host boat plays the game. This is a rummy-like card game, but with tiles, which stand up better to cruiser elements, like water. There are 4 tile colors and each color has two sets. To play, you make sets of groups and runs. You can also play on other players tiles. The first one to use all their tiles wins! Here’s a video I found on YouTube that helps explain how to play. This particular set only comes with 4 tile racks, but we’ve played with more by just using something to hide their tiles. We also ditched the box long ago and, instead, use a large plastic powdered creamer tub to house the tiles. No need to flip over all those tiles before you play, just draw from the tub! This is the classic quick-draw game with a modern upgrade: erasable boards and dry erase markers, so it’s boat friendly! This version also comes with clues for both adults and kids. So, this actually comes with a game board, but we tossed it. That’s not how we play. We just mark a point for correct guesses and whichever team has the most points by the time we don’t want to play anymore wins. 😆 For storage, everything fits easily into a large ziplock bag. https://www.youtube.com/channel/UCVeEx96wzFgzhXsy7cBC8hw This is GatherTogetherGames’ YouTube Channel. He does a great job explaining and showing how to play games. He even has playlists…be sure to check out ‘Large Group Card Games’ and ‘Card Games for Kids’.